I’ll be looking out for this issue for sure ! I’ve been prowling the magazine stands for the issue. They still seem to only have last month’s issue, the one with the Beatles or something. I let my subscription run out months ago. I think FW has some of their best work, but it were shy of two filler tracks I would say it was a complete masterpiece. Preparing for incoming flak in 3..2..
Just picked it up today……..what a great issue! The interview with Eddie is very cool and very detailed. He seems incredibly honest in it and doesn’t use any of his canned expressions from other interviews. Loved it. Although I would’ve like it to be longer and more in depth on each song……….but I’m sure everyone wants that. I didn’t know about the ending of Drop Dead Legs. Very cool and you can definitely hear it when you know how it was done. Just picked it up today........what a great issue! The interview with Eddie is very cool and very detailed. He seems incredibly honest in it and doesn't use any of his canned expressions from other interviews. Loved it. Although I would've like it to be longer and more in depth on each song..........but I'm sure everyone wants that. I didn't know about the ending of Drop Dead Legs. Very cool and you can definitely hear it when you know how it was done. Honest to God truth, we are down to three copies of this new 1984/Eddie Guitar World. We got stacks of them in (about 25-30). Every time we get a GW with Ed on the cover, it goes fast. still want to read about him. on a recent podcast he was on (2012, maybe Jay Mohr or Joe Rogan) they asked him that. He wasn't overly decisive but basically said VH1 was his favorite. 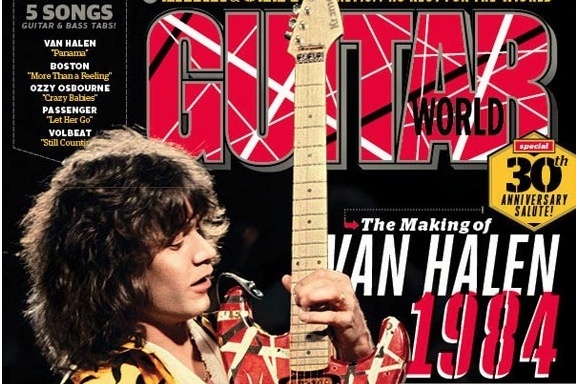 EVH references FW as the best representation of him and VH. Sorta, but not exactly. In that paragraph he was comparing Diver Down and Fair Warning, and he says, “To me Fair Warning is more true to what I am and what I believe Van Halen is.” A full album by a rock band, not a bunch of cover tunes. Good to see you back , Cowboy !!! Someone was just mentioning you the other day – the fact that you’ve been gone a while . I’m looking forward to picking up this issue as well . The guitar doesn’t looked plugged in . Good call . It’s probably a photo from the making of the “Jump” video ??? The clothes/hair seem to match . What was the “Drop Dead Legs” part you mentioned ? Agreed……….he’s not a relic, he’s a LEGEND!!! That’s pretty wild stuff . More magic from Eddie and Donn !!! I got a chance to read it today, I have to say it exceeded my expectations. I thought it was just going to be a rehashed interview but it turned out to be brand new. I really enjoyed Eddie’s comments on the album and on studio 5150. What did it have on Jake E. Lee ? How he didn’t want to become an 80s relic, how him and Ozzy had nothing in common, how his new group came to be, how he converted a Fender into his “Charvel” and how he was in Ratt in their club days. How he didn't want to become an 80s relic, how him and Ozzy had nothing in common, how his new group came to be, how he converted a Fender into his "Charvel" and how he was in Ratt in their club days. Jake was “my main man” right around when I started getting heavily into VH . His playing/look/attitude simply floored me !!! Picked it up today . Wow , what a great issue . I loved the EVH stuff . Lots of great pics and insightful comments . The Jake E. Lee article was also a blast to read . He really has been sorely missed . I love his devil=may-care attitude to the whole guitar hero and popularity thing . It was funny to read his comment about sharing solos in Ratt w/Robin Crosby (RIP) .